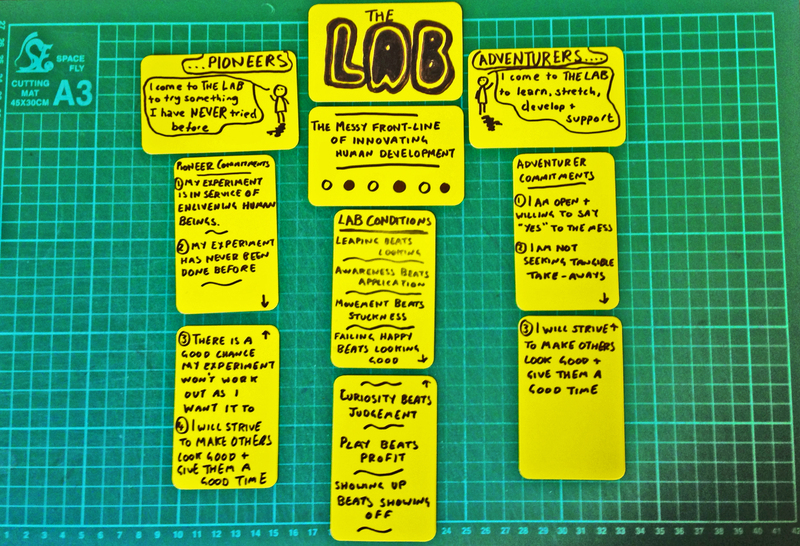 The lab is a not-for-profit place to experiment and be experimented on, a place for people to come together to play and challenge the often stale world of human and organisation development. It is an place where you can try out creative and innovative developmental experiments that you have never tried before without fear of whether they will work or not. It is a place to come and learn through stepping out of your comfort zone and into a live, messy and exciting world of experimentation. Anybody can come along as a pioneer, an adventurer or both. The lab is structured around the Lab manifesto at the top of this page. The manifesto is a set of intentions, held lightly on artefact cards, that will evolve as The Lab evolves and develops. We only ask that anybody who comes to The Lab does so in the spirit of the current manifestation of the manifesto. A place at The Lab costs just £35 to cover costs (plus Eventbrite booking fee) and a maximum of 20 places are available. If you wish to bring an experiment then you are asked to bid for a time slot in advance to ensure everything fits into the time we have available. Calls for experiments are sent out to attendees around 5 weeks in advance. The Lab takes place in Neal Street, the heart of London’s Covent Garden. Click here to sign up to “Lab Notes” to be kept informed of future dates, experiments and stuff. * The Lab is not-for-profit due to the belief that the transaction of cash for services has a detrImental impact on the nature of pure ‘fail happy’ experimentation. The Lab fee of £35 (plus any third party booking fee) goes to cover venue hire, materials, PR and any surplus goes into reserves, REFERRED TO AS “THE LAB FOUNDATION.” THESE FUNDS ARE USED TO PAY for future Lab activities, subsidise future Labs that may not have enough attendees OR TO PAY FOR A PLACE FOR those who wish to attend but do not have the financial means to do so. The accounts for the Lab AND THE LAB FOUNDATION are available on request. Pingback: Fertile vs. Fruitful – Does cash stifle creative experimentation? | Can Scorpions Smoke?